This sunset at Bryce Canyon was special. In addition to a rainbow (and faint secondary bow) due to the scattered and persistent storms, this evening brought one of the most distinct examples of anti-crepuscular rays I've ever seen. Crepuscular rays are the familiar sunbeams or shadows that appear to radiate from the point in the sky where the sun is located. Anti-crepuscular rays are observed when atmospheric conditions allow those rays (actually parallel but apparently divergent due to perspective) to reconverge at the opposite (eastern) horizon after passing directly overhead. 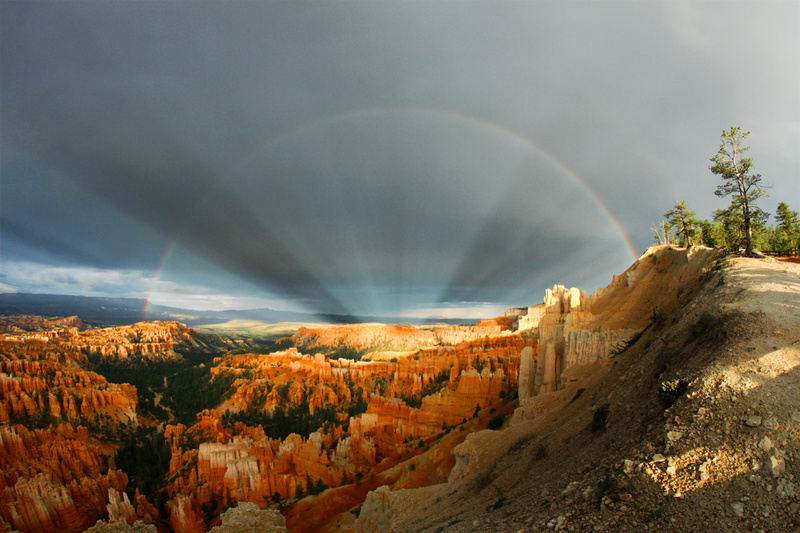 Since both rainbows and ant-crepuscular rays are centered on the anti-solar point (e.g., the point directly opposite the sun), they share a symmetry that makes a striking visual display when they’re seen together. You can tell that this photo was shot with the sun still well above the horizon: the anti-crepuscular shadows clearly converge upon a point that would be well below the local horizon, below the center of the rainbow. The picture was snapped at 8:07 pm local MDT, about 45 minutes before sunset on July 7, 2015. This was a truly magical sight, and only persisted for a few minutes. Fantastic! Click the “next” button to see another photo of this scene, snapped just a few moments after this one. Featured as Astronomy Picture of the Day for July 28, 2015. Awesome, How can we get rights to use in Bryce Canyon calendar??? Very nice! I was at Capitol Reef 7/12-7/17 myself. I look forward to going back..
very nice photo John, thanks for posting that.